I have been playing the fiddle for about 10 years now. I am a decent player, focusing mostly on the Old Time genre with the playing of fiddle tunes. It’s been a slow road, but I have made great progress! Because of my training in audiation - even before I knew what the word was - I can hear melodies very well, and play both by ear and from notation. 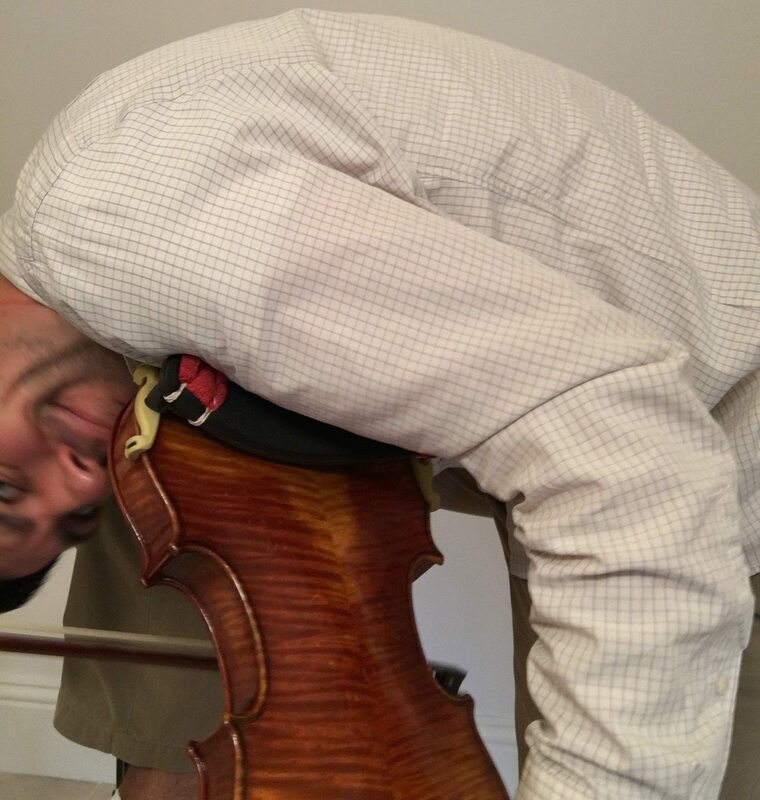 I am getting to the point where I’d like to venture out into the world of bluegrass fiddle, which requires much more improvisation than I normally do. I can certainly improvise on the fiddle, but not nearly at the speed I would like to. I marvel at how bluegrass players can execute a steady stream of notes at rapid fire tempo, and never miss a beat! Listen to Vasser Clements provide a seemingly endless stream of notes! I would love to eventually be at a jam, and when it comes my turn to solo, whip out a lead that may not impress others, but at least impress myself! 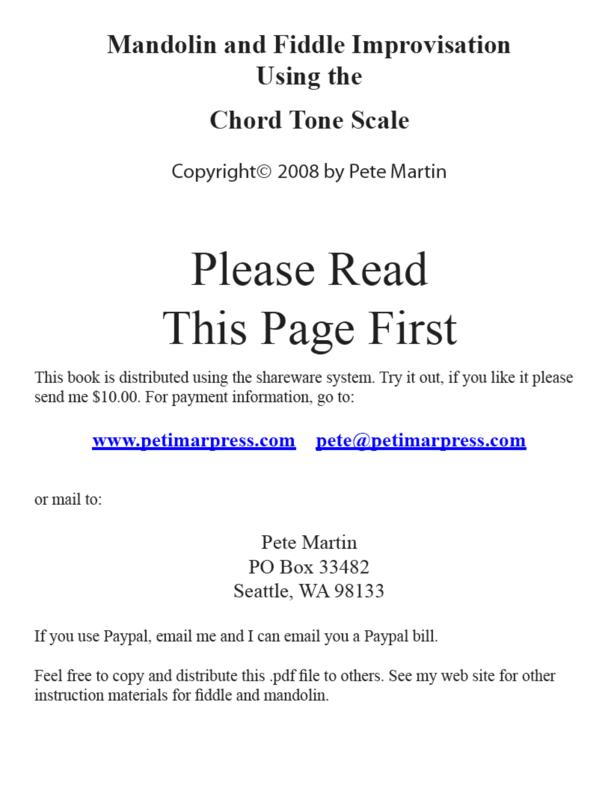 In my scouring of the internet to find resources to support this recent initiative to improve my bluegrass and folk soloing, I came across a very noteworthy item: Mandolin and Fiddle Improvisation Using The Chord Tone Scale by Pete Martin. This book is distributed using the shareware system. Specifically, it is free to view and try. If you like it - which I know you will - Pete asks that you remunerate him via PayPal for $10. Let me say that this is just the thing I needed to give my practice routine a shot in the arm. Scales were always tricky for me to incorporate into my soloing because the right notes never landed at the right time. What is the Chord Tone Scale?? I don’t mean to obfuscate or be cagey, but I think Pete explains it very well in the book, and I’d rather you go right to the source! I wanted some backing tracks in a folky style to use to practice these new scales and licks over various chords, and couldn’t find anything on YouTube that fit a folk style. So, I brewed myself a pot of coffee yesterday afternoon, fired up Logic on the old Mac, and came up with these tracks. They’re not as good as having a real band, but you could do a lot worse. I made these tracks in the main folk keys (C, D, E, F, G, A, B and Bb), and at varying tempos. I uploaded the 72 bpm tracks to YouTube, and they are free to use and share. For those of you that want the rest of these mp3 tracks in the remaining tempos, I am offering them for sale for a cool $5. 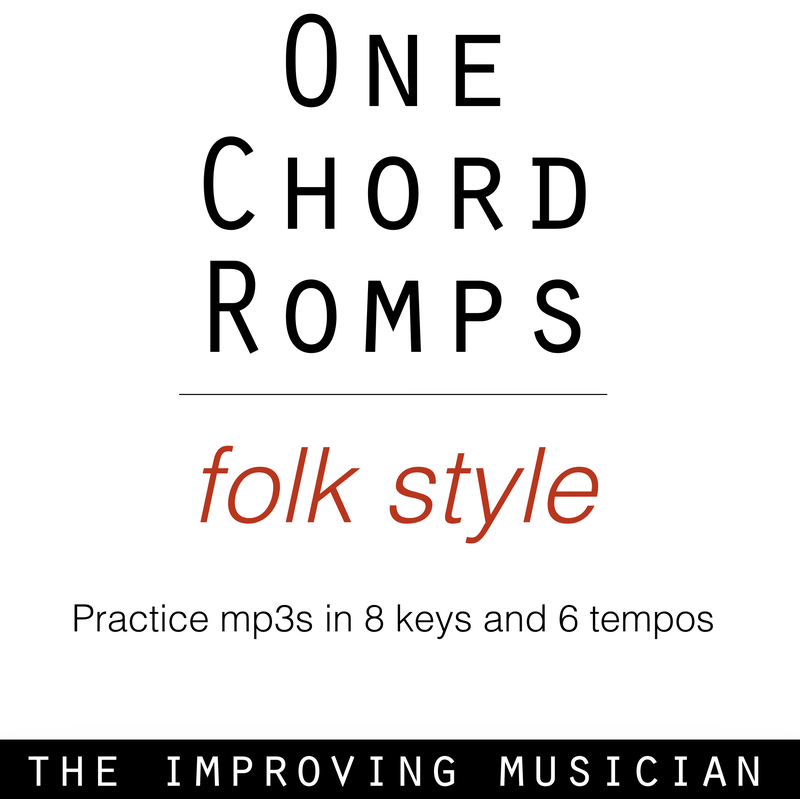 Let me know if you try out the Chord Tone Scale, and if it has positive effects on your playing. I can already see a difference in my soloing! Well, at least in the key of G so far.